Do You Know What Vixi Stands For? Come Find Out How To Be Vixi Too! Hang tight. You are about to find out what Vixi stands for…and then you will want to be Vixi too! Not long ago, Kate, the founder of VixiBar, sent me a package of her line of amazing protein-packed natural food bars. I was excited to try them considering I already loved her philosophy on health, nutrition, and active living and figured her bars would represent this as well. Vixi Bars are an all natural food bars that contain 12 grams of natural whey protein. They are also gluten free, grain free, soy free, lactose free, non GMO, rich in fiber, and free from any added sugar or preservatives. Disclaimer for all of my DAIRY-Free friends here: Please note that while the bars are Lactose Free, these are NOT Dairy free. They do contain Whey Protein. Disclaimer for all of my NUT-free friends here: Please note that some, but not all, of the flavors do contain organic peanuts. One of my favorite things about these bars is how short the ingredient list is on each bar. There are only 5 or 6 ingredients (depending on the flavor) in each bar…and each ingredient is an actual real food that you can feel good about eating. You can see all of the ingredients in each of the flavors on the VixiBar Product Page where you can pick which ones you want! Then you can add your favorite flavors to your Shopping Cart! Of course, how they taste is what is most important here. After all, if they do not taste good, my family is not going to eat them. Thank goodness my two little self-declared starving munchkins volunteered to help as testers. I swear they act as if I don’t feed them. But I do. I promise. My oldest took one look at the flavors and made absolute sure that the Cherry Brownie, Pumpkin Pie, and Peanut Butter and Jelly flavored bars were going to be his. My youngest, as usual, just let his older brother tell him what to do and gladly accepted the Coconut Bliss and Apple Crisp flavors. In the end, we really shared all of the bars and we each tasted all of the flavors. The boys kept fighting over who was going to get a taste of what. And any time they started fighting over them, Mom came in and saved the day by taking the bar in question to enjoy herself. We loved all of the flavors that we tried, but my hands down favorite was the Coconut Bliss. I could eat that one every. single. day. And except for the few flavors that contain peanuts, the rest are actually a perfect bar to send to a nut-free school as a treat in the lunch box as well. That is a huge plus in my book. VixiBar is on a mission to let everyone know that they can have a natural food bar with both functional benefit and great taste – a bar without compromise! I think these bars are achieving that mission for sure! One lucky follower will win a Variety Pack of 10 VixiBars delivered straight to your doorstep. 1. In one sentence, tell me which flavor sounds the best to you..(if you win, I will make sure that flavor is included in your package). 3. Follow VixiBar on Facebook (or tell me if you already do). One winner will be chosen at random on Wednesday, April 25th at 7:00 am Pacific Standard Time. Winner will be contacted via email then. Entrants must be 18 years of age or older. I love peanut butter anything so the peanut butter cup really intrigues me. I like VixiBar on FB. I think the coconut bliss sounds divine! aaaaaaaaaaaaaaaand now I like Vixibar on facebook. I am a fan/freak of anything coconut so I am sure I would love the Coconut Bliss! I would love to try the chocolate macaroon. Those are my 2 favorite flavor combinations. I am so glad your bars are gluten-free and soy-free. I also appreciate that they are high-protein and good source of fiber. YUMMO and healthy too! Thank you for your contribution to our optimum health and satisfying our sweet cravings. I follow you on Facebook – thanks for this contest! I am thrilled to find a gluten free and soy free bar! I hope I can find them to buy locally soon. Hey, I just liked Vixi Bar on Facebook and discovered they are from my area! Yay. Maybe that means I can find them in stores here soon! Follow Vivi on FB too – thanks for a fabulous giveaway! Peppermint Patty sounds so good — I want to look for these at the grocery tonight!! I love apple pie so definitely Apple Crisp for me! 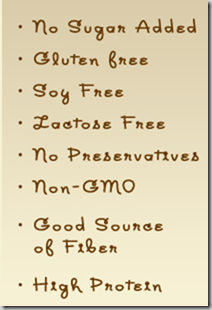 Following Cook It Allergy Free on FB – thanks! Peanut Butter Cup sounds delicious. I would love to try the coconut bliss, thanks for the giveaway. The Coconut Bliss sounds fabulous! Chocolate Macaroon sounds fantastic. Such a great giveaway! Looks like a fabulous bar! I think coconut bliss sounds wonderful! Can’t decide between Chocolate Macaroon and Coconut Bliss. Both sound wonderful. I follow Vixibar on FB. The cherry brownie sounds good but you sure made the coconut bliss sound wonderful as well. Peanut Butter & Jelly – yummy just like a sandwich! I would choose pumpkin pie! The peanut butter cup sounds fabulous! I can’t wait to try the coconut bliss! I am now a following you on facebook! And, now I just liked Vixibar on facebook! The Peppermint Patty bars sound best to me! This is hard to decide, but I think the peppermint patty would be my first choice. My FB might be under my other email address too: suzannestapler@yahoo.com. The flavors that sound the best to me are chocolate macaroon and cherry biscotti, although they all sound good. I have Liked you and Vixi on FB. Pumpkin Pie – no matter what season it is – always delicious! I would love, love, love to win some Vixi Bars! Thanks! Cherry Biscotti sounds great with Coffee! Cherry Brownie and Pumpkin Pie sound delicious! I follow Vixi on Facebook! Coconut Bliss for me please!!! I follow Vixi Bars on Facebook! Peppermint Patty!!! Oh sounds so good! Chocolate Macaroon sounds delicious – since I’m assuming it’s chocolate and coconut, a divine combination, if there ever was one. p.s. I don’t see it specified, but is the contest open to Canadians? If not, it’s no problem, just wanted to know. Just stared following vixi bars! Just started following cook it allergy free too! Thanks for sharing two great pages I never knew of!! So hard to choose just one but Chocolate Macaroon is calling my name! love to try pumpkin pie!! The coconut bliss sounds heavenly!